ARE you prettier than Paul McCartney!? I'm not in a relationship, remember? How long do you think you'll be together, by the way? BONUS IMPORTANT QUESTION! Who's your favorite Beatle? TWIST AND SHOUT defines your love life! TWIST AND SHOUT defines your love life: you're always on the chase, you're always in the "fun part" of dating, but it never gets any deeper than that. But that's okay. Why? You're enjoying yourself, of course!! I WANT TO HOLD YOUR HAND defines your love life! You're so sweet, so innocent. Why is why I WANT TO HOLD YOUR HAND totally defines your love life. You're all about smiles, and walks on the beach, and generally the most wholesome parts of love. Don't be afraid to get more intimate! OH! DARLING defines your love life! You're in the middle of a tumultuous breakup. Or a dramatic relationship. Either way, you know it's not going anywhere. But you still don't want it to end? It's weird, you know, but it's, well, YOU. Take care of your heart, okay? ALL YOU NEED IS LOVE defines your love life! You're so golden in love. Which is why ALL YOU NEED IS LOVE is totally the definition of your love life. You understand how to give, and take, and support, and basically be a fantastic all-around partner. Teach us your secrets!! 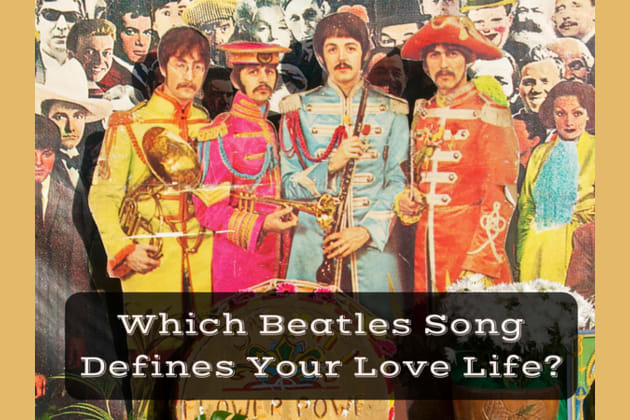 Find out your Beatles love bop!